This is the third part in a multi part tutorial on using the Bowcaster exploit development framework to build a buffer overflow exploit. Here are part 1 and part 2. In the last part, we had built an exploit buffer and added a ROP chain that would flush the MIPS CPU cache, locate the stack (which is randomized), and return into it. Now it's time to add a payload. Bowcaster provides a few MIPS Linux payloads, and the one we'll use for this buffer overflow is the connect-back payload, which will yield an interactive shell. In order to create a payload object, you must pass the constructor a ConnectbackHost object. The host object is created from the IP address and TCP port you want your target to connect back to. The "port=" parameter is optional and defaults to 8080. In addition to the host object, the payload constructor requires an endianness parameter. If you have a set of restricted bytes that you must avoid in your buffer overflow, you may want to use an encoder. You also will want to use an encoder if your connect-back address or port will contain nul bytes, such as 192.168.0.1. Bowcaster provides an XOR encoder that will attempt to encode your payload, sanitizing out your bad bytes. Similar to normal payloads, encoded payloads have a shellcode attribute. Below is the previous example, modified to encode the payload. There are some important things to note about the encoder. First, it only encodes your payload. So if there are bad bytes in your ROP chain, there's nothing the encoder can do about that. As I explained in the previous part, if you attempt to create a replacement section with SectionCreator that would have bad bytes, it'll let you know by raising an exception. So at least there's that. Also, the XOR encoder scans its decoder stub, which, of course, has to stay unencoded, for your bad bytes and will raise an exception if it fails that test. Additionally, the XOR encoder takes an optional parameter, "key=", which needs to be a 4-byte integer. If you provide this, the encoder will attempt to use that key to encode your payload. If the key itself or the encoded payload contains any of your bad bytes, an exception is raised. If you don't provide a key, it generates one randomly. It will make a certain number of attempts to generate a key and encode your payload without bad bytes. If it exceeds the maximum number of attempts without a successful encode, an exception is raised. This brute-force method is kind of a pain because it means sometimes the encode will be successful, other times it won't. It may fail once, then succeed if you run it again. Boo. If you have just two or three bad bytes, the encode will almost always succeed. The more you have the less likely it will succeed. Anyway, the encoder logs the key that it used. If you find one that works, then save it and pass it to the constructor from then on to make sure your encode always works. In the next part, I'll show how to use one of the connect-back servers provided by Bowcaster in place of the netcat listener. UPDATE 4/17/2013: Added explanation about payload and encoded payloads having a shellcode attribute. I may make this tunable or self-tuning in the future. Not sure. Open to ideas on this. This is the second in a multi-part tutorial on developing a buffer overflow exploit using Bowcaster. Here's Part 1. In part 1, we had gotten a crash by sending a 2048-byte pattern to the vulnerable program. The saved return address had been overwritten with 0x41367241 and restored to the $ra register. That value is located at an offset of 528 in our overflow buffer. Now we need to start describing ROP gadgets and substituting them for parts of the 2048-byte overflow string. In order to start replacing parts of the overflow string, we need to create a list of replacement sections. The easiest way to do that is to use the SectionCreator class. This is essentially a factory that generates OverflowSection objects. You need to know a couple of things in order to instantiate a SectionCreator object: the endianness (which we already identified as little endian), an optional base address of the library you want to ROP into, and an optional list of bad bytes. If you provide the list of bad bytes, you'll get an exception if any of the overflow sections you create contain any of the restricted characters. The base address of libc is 0x4084a000. The vulnerable function simply does a recv() into a buffer on the stack, so it doesn't actually have any restricted bytes. But for the sake of example, we'll assume we can't use nul or space, 0x00, and 0x20, respectively. Like I explained previously, we need to find the library addresses of our ROP gadgets manually or with other tools. I use IDA Pro, but you can disassemble with objdump and do the same. The first ROP gadget we need is a function epilogue that restores a bunch of the MIPS S registers from the stack. The picture above is an epilogue at 0x31B44 in libc that restores $s0-$s7, plus $ra. Who knows what this function is? Who cares? 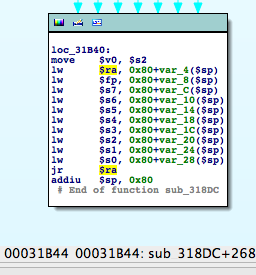 IDA calls it sub_318DC. Good enough. The gadget_section() method takes a mandatory offset and and address value, and an optional description and optional base address. The description is just a textual description of this overflow section. It gets used in log output, exception messages etc, and helps you debug your exploit if things go wrong. If you don't provide a description, a generic one gets generated. This is where you can override the base address you specified earlier. Say instead of a ROP gadget, you just want to put a placeholder on the stack that will avoid blowing up the program before the function returns. Here you could provide the literal value to gadget_section() and override the base address with 0. This value will get encoded with the proper endianness and placed in the buffer. There are a couple of things to note about the OverflowBuffer class. First, when you create it with a list of sections, those sections replace portions of the filler pattern. The parts of the pattern that come before and after each section remain undisturbed so their offsets stay the same. Second, if any of the sections in your list overlap, OverflowBuffer will log an error message listing problem sections (this is where the optional description strings are useful), and it will raise an exception. [!] "A's overlapping with D's"
With this gadget added, run your exploit once more and see what values get restored to the S registers and $ra. Like before, use find_offet() to figure out the offsets into your buffer where you'll need to place your gadgets such that they'll be loaded into the appropriate registers. Stage an argument to sleep() into $a0 (for data cache flushing; MIPS cache-coherency). Load some offset from $sp into an S register, thereby locating the stack. Jump to the S register containing a stack address. To give you a more complete picture of how to build your ROP chain, below is a listing of the gadgets I used for this exploit. Pass this list to the OverflowBuffer constructor to create a buffer overflow string containing your ROP chain. In the next part, I'll describe adding a connect-back payload section to your buffer overflow string as well as how to use a payload encoder. In a future tutorial I'll describe the use of the EmptyOverflowBuffer class. Instead of taking a list of replacement sections, it starts out with 0 length, and you build it up by appending sections one at at time. UPDATE 3/29/2013: Added syntax highlighting. Added import statement for SectionCreator. This is the first in a multi-part tutorial on developing a buffer overflow exploit using Crossbow (now called Bowcaster), which I released earlier today. For this tutorial I've written a simple program in C that overflows a buffer on the stack with whatever it reads from the network. I cross-compiled it for MIPS Linux and ran it using QEMU chrooted into the unpacked filesystem of the Netgear WNDR3700v3 (Firmware 1.0.0.18). * reads up to 2048 off a socket onto a small buffer on the stack. This is a contrived example but it should make it easier to focus on the mechanics of using Crossbow without getting bogged down in real-world complications. The first module to know about when developing a buffer overflow is bowcaster.overflow_development.overflowbuilder. This module contains classes that will be useful for building an overflow buffer. There are two main classes to choose from when bulding your buffer, OverflowBuffer, and EmptyOverflowBuffer. They each represent a different way of solving the same set of problems, and they each have their advantages. For now, we'll use the first; OverflowBuffer. I'll do a subsequent tutorial show how to use the second. The OverflowBuffer class starts you out with a buffer of a specified length filled with a pattern string consisting of upper and lower alphabetic characters and numbers (to help with debugging). One at a time, you can start replacing sections of that buffer with things like ROP gadgets or your payload. Here we instantiate the OverflowBuffer object, passing it "LittleEndian" and the size of the buffer we want to create; 2048. The $ra register contains 0x41367241. OverflowBuffer provides a function, find_offset(), that takes a string or an integer and will locate that value in the overflow string. I like to add an option to my exploit program that lets me provide a search string on the command line and find the offset. When searching for 0x41367241, it is found 528 bytes from the start of the overflow buffer. Now we can insert the first of a series of ROP gadgets at offset 528. Controlling several S registers is important for staging ROP gadgets, but unfortunately this vulnerable function doesn't restore any S registers before returning. We can only control the $ra register. That means we need to return into a function epilogue that does restore several S registers. While bowcaster doesn't provide the capability to search for ROP gadgets, this can be done in IDA Pro or using objdump from your compiler toolchain. In the next part I'll cover how to describe your ROP gadgets and add them to your overflow using Crossbow. If anyone wants to contribute, a MIPS ROP finder that can be used independently of IDA would be super double awesome. UPDATE 3/29/2013: Added syntax highlighting using https://github.com/Siarc/code2html. Thanks for the tip, @0xKD. UPDATE: Crossbow has been renamed to Bowcaster. It turns out "Crossbow" is a popular word. Who knew? A company in California has the word registered as a trademark in the US in connection with computer software. They might be cool with us using the word, since this is an open-source noncommercial product, but we've decided to change the name just in case. Hopefully the new name is esoteric enough to avoid any naming conflicts, while still being cool and fun to say. I'm leaving this post as-is, save for the new Github link. The old Github project will stay up for a while, but you should use the new one from this point on. I'm proud to announce the open source release of a project I've been working on since January called Crossbow. Vulnerability research on embedded systems, particularly MIPS Linux systems, is an underserved area. Other targets such as x86 desktop systems and ARM smartphones and tablets have a wealth of tools and techniques readily available to the researcher. In the past year and a half as I've been doing more and more research on embedded devices and developing exploits for them, I've had to roll a bunch of my own code whenever I needed something that wasn't already available. I began to realize that I should probably pull all these things together into a single project to help with exploit development. Crossbow is that project. Why "Crossbow"? Mainly because I thought it sounded cool. But also because I wanted the name to evoke the image of an offensive tool that is lightweight and uncomplicated. At Tactical Network Solutions, we don't generally use the defacto standard Metasploit Framework for exploit development. This is for a variety of reasons. Among them is that we mostly code in Python. The tools, libraries, frameworks, etc. that we've all developed internally are mostly in Python. Plus, the vulnerability research community has really crystalized around Python as a research and development language, so there are a ton of external resources in that language. Point is, we'd like to stick with Python if we can. Also, MSF provides a whole lot that we don't need but not very much that we do need. We wanted something useful but lightweight. You can install Crossbow on your development system, or just stick it right in the source tree of your exploit code. Whatever. It's all good. So this is the motivation behind Crossbow: Python code that eases the development of exploits, plays nice with our other stuff built in Python, and doesn't provide a ton of stuff we don't really need. To be clear, Crossbow is to aid in the development of exploits. It's not an exploitation framework or pen-test tool in and of itself. I don't envision packaging actual exploit code with it. Its purpose is to abstract some of the tedious details of exploit development such as encoders, payloads, building a ROP chain, etc. I hope to post a few tutorials in the next few days on using Crossbow to develop exploits against embedded systems. Please try it out and let me know what you think. If you'd like to add features or fix bugs (and I really, REALLY hope you do), clone my repo and send me a pull request. Cheers and keep up the hacking.